Recently all news dailies carried the headlines : ‘inflation rate has crossed double digits’. This indeed is worrying. So what is inflation and how does it affect the common man. In simple terms inflation is nothing but rise in the general level of prices of goods and services in an economy. What leads to this rise in the price of goods? It is ‘too much money chasing too few goods’ which leads to the rise in the prices of goods. It is a simple demand-supply mismatch. Because of inflation, our paper money or currency starts losing its value. Some 15 years back when I saw my first movie in a movie hall it cost me Rs 15 to watch that movie. Now 15 years down the line, to watch the same movie in a multiplex, it costs me about Rs 225. So in 15 years the cost of watching a movie has multiplied 15 times. Now it might cost you Rs 15 just to park your car in the multiplex basement, forget about watching the movie in Rs 15. That’s inflation for you. Let’s take a simple example to understand this. Suppose you have a currency note of Rs 100. Assume that as on today with this currency note of Rs 100 you can buy 1 dozen apples (mind you this is just an example. In real life good quality apples are much more costly and I doubt if Rs 100 will even buy you half a dozen of good quality apples). But you don’t need these apples as on today and need them 1 year down the line. So you don’t buy the apples today as you can’t store them for one year as they will get spoilt. So you invest this Rs 100 for 1 year in a bank fixed deposit which will fetch you 8% at the end of 1 year. Now at the end of 1 year you have Rs 108. But let’s assume that inflation as compared to last year has risen by 10%. This effectively means cost of living or general prices of products have risen by 10%. So now the same 1 dozen apples which were costing you Rs 100 about one year back will now cost you Rs 110. Your money has grown by 8% (Rs 100 has become Rs 108) but the prices of apples have gone up by 10% (price increased from Rs 100 to Rs 110). So to buy the same 1 dozen of apples now (1 year down the line) you will have to put an additional Rs 2 from your pocket. This effectively means your currency or paper money has lost value. This is because of the effect of inflation. If the cost of living goes on increasing at this rapid rate every year, then 10 years down the line I doubt whether the same Rs 100 rupees will be able to buy even a single apple, forget about buying 1 dozen apples with Rs 100. Had you bought the apples last year you would have managed to buy 1 dozen apples for Rs 100. But since you are buying them one year down the line and the return on investment (8%) that you have earned is less than increase in inflation (10%), you have to put more money from your pocket. So inflation erodes the value of your money over a period of time if the money is not invested wisely. So even on the face of it, it seems that your investment has made a return of 8% (nominal return). After considering the inflation rate (10%), the real return is a negative 1.81. Which means actually on maturity you did not make any money, infact your money has lost value due to inflation. Surprised and hence the name of the article – ‘Inflation – The Silent Monster’ – inflation silently erodes the value of your money if you don’t invest wisely. So consider the effect of inflation while measuring your returns on maturity. Use following calculator to find your real investments real return . Whenever the Weekly or Monthly Inflation Number is declared by the Government, the number represents average inflation which takes into account the rise in the average cost of living. This is a much broader number. If we break down this broad number into different components then we realise that different components have varied impact on individuals. All people are impacted by common things like food inflation and fuel inflation. People who have small children have to prepare themselves for Children Education Cost Inflation and Children Marriage Cost Inflation. So how do Children Education Cost Inflation and Children Marriage Cost affect and why do parents have to plan for this? Let us try to understand this with the help of a case study. Let us take the example of Ajay. He wants to make his 1 year daughter, Priyanka a MBA when she grows up. Priyanka will take admission for the MBA course when she turns 21 years old. So Ajay has 20 years in hand to plan for Priyanka’s education. The MBA course as on today costs Rs 4,00,000. If we assume that education costs (inflation) will rise by 8% every year, then the same MBA course will cost a whopping Rs 18,64,382 after 20 years. To accumulate this Rs 18,64,382 in 20 years, Ajay will have to make a monthly investment of Rs 2046 per month if his investments earn a return of 12%. So even though the amount of Rs 18.64 Lakhs seems huge on its face, with regular investments, and the magic of compounding over a period of 20 years, this mammoth target can be achieved with investments of as low as Rs 2046 per month. But the secret to success is to start early and make regular and disciplined investments. If the returns earned by our investments are 15% then the investment amount further falls to Rs 1421 per month. Historically equities have given annual returns in the range of 15% over a long period of time. If the target of Rs 18.64 Lakhs has to be achieved without taking much risk through a Public Provident Fund (PPF) account which guarantees a return of 8%, then this target can be achieved with a monthly investment of Rs 3276 per month. It is very important for the parent to start investing for the child’s future as early as possible. Starting early allows his money the much required time to grow and reap the benefits of compounding. Let us consider the above example of Ajay planning to accumulate money for Priyanka’s MBA course. His goal is to accumulate Rs 18,64,382 in 20 years. To accumulate this Rs 18,64,382 in 20 years, Ajay will have to make a monthly investment of Rs 2046 per month if his investments earn a return of 12%. If Ajay delays the investment plan and starts investment when the daughter is 6 years old, then in this case he will have 15 years to achieve his goal. In this case the monthly investments that he will have to make will rise to Rs 3956 per month to achieve his same target of Rs 18.64 Lakhs if his investments earn a return of 12%. If Ajay delays the investment plan and starts investment when the daughter is 11 years old, then in this case he will have 10 years to achieve his goal. In this case the monthly investments that he will have to make will rise to Rs 8400 per month to achieve his same target of Rs 18.64 Lakhs if his investments earn a return of 12%. If Ajay delays the investment plan and starts investment when the daughter is 16 years old, then in this case he will have 5 years to achieve his goal. In this case the monthly investments that he will have to make will rise to a whopping Rs 23205 per month to achieve his same target of Rs 18.64 Lakhs if his investments earn a return of 12%. Use this Goal Planner Calculator to Plan your future goals . 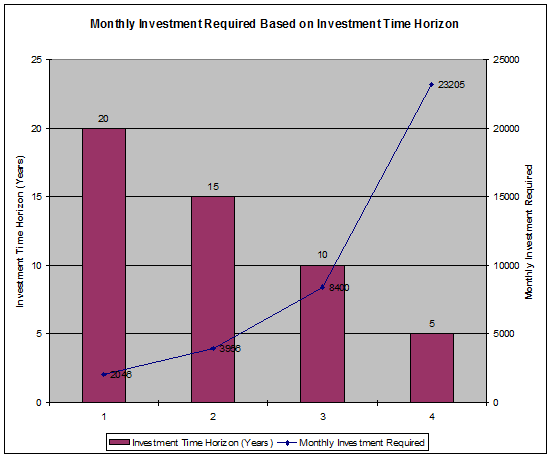 The below table shows the monthly investment that will be required by Ajay to achieve his goal of Rs 18.64 Lakhs based on his investment time horizon. It is assumed that the investments will earn 12% in all the scenarios. The sooner the parent starts planning for the child’s education and marriage the better. These are long term goals and need proper planning. This is the best gift that parents can give to their children. As a parent the sooner you sow the seeds of early investments, the bigger will be the fruit the tree will bear which will take care of your child’s all future needs, primarily education and marriage expenses. Like education it is the same story for children’s marriage expenses (inflation). If you as a parent feel that today your daughter’s marriage will cost you Rs 7,00,000 then the same marriage will cost Rs 11.27 Lacs 5 years down the line if expenses increase (inflation) at the rate of 10%. Let us consider the following case study to understand this thing better in simpler terms. Sharon has an 8 year old daughter Mini. Sharon needs to accumulate funds for her daughter’s marriage. The marriage is planned 16 years from now. According to Sharon, as on today, Mini’s marriage will cost Rs 4,00,000. If inflation (rise in costs) of 5% is assumed the same marriage will cost Rs 8,73,150 after 16 years. If Sharon wants to make a one time investment which will give her Rs 8,73,150 on maturity after 16 years, she will have to make a lumpsum investment of Rs 1,42,429 (assuming the investment earns a return of 12% p.a.). But many of us don’t have lumpsum amount to invest and we prefer to make monthly investments. To accumulate this Rs 8,73,150 over a period of 16 years Sharon will have to invest Rs 1,615 per month if her investments will earn a return of 12% p.a. Watch this video which shows you the effects of Inflation in Zimbabwe and how the paper money has lost all its value. I have 28K Rupees I want to invest it to get quarterly interest at rate of 7.5% please let me know where should I invest this amount, I don’t want to take risk but I want guaranteed return. Is there any official website that shows inflation rate in India? I am not aware of any . But if you do google search , you will get lots of information on this . VERY very nice information to be understood by a layman. (even my father can easily understand this ,who is aged 50 today)..
Glad to hear that Mayank ! Nice article,,, I have an idea(correct me if i am wrong), the Main cost(commitment) of every parents is “children education and marriage cost”. For this, from starting (st)age -children should be well studied and get pass in merit i.e 98 or 99 % then we wont be pay more money for joining the higher education(will get merit seat) this leads lesser amount to pay for college . The above data are by assumption only, but if we try we can make it real. I dont think this is right way of thinking , its like leaving thing for luck ! excellent and candid explanation of value of money . All the calculations assume expenses in the year of retirement (in the example Rs.2040000/-) to generate which the capital required would be Rs29100000/-. This is very clear. Suppose the person in the example lives for 20 years after retirement. During this period also there would be increase in the expenses every year because of inflation. My question is whether the corpus of Rs.29100000/ would suffice to take care of expenses for 20 years post retirement ? Suppose he lives for 30 years after retirement. What happens then ? And finally, will he be able to leave something for his heirs ? If so, how much ? You can invest 20% of your investible portfolio in equity funds, short term loss would be covered by your debt portfolio & you can look for better returns in the long term. Thanks, I will study the various options, I am learning and learning, and have already started investing in Mutual funds. Could I have some links for knowing more about Demat account, trading accounts? Thanks.I will.Your articles too are awesome and inspiring and I learnt a lot from it. For a cautious investor who doesnt want to take the risk of investing in equity funds, then what is the recourse to beat the inflation? I generally park my funds in fixed deposits in banks, now reading this article has made me aware of the foolishness of investing there. But at the same time I do not want to risk the small money that I have amassed over the years. What is the recourse then? Kindly suggest. Thanks in advance.Regards and thanks for the eyeopener articles. I have a lot to learn!!!!!!!!!! sadly there is no way . You have to accept that risk and return will go hand in hand , without taking risk you can only earn a limited return which will not beat inflation , the more return you want , more risk you have to take . 1. What has been the average rate of inflation over the past 20-30 years in India? It’s important to consider the long-term average. 2. Where can one find these inflation figures over the past several years? Even a site that shows the long-term average would be helpful. There should ideally be an official site of the Government for this. That’s pretty bad then. If you think of it, 30 years from now, Rs. 1 Crore will be worth what today’s Rs. 15 Lakh (approx.) is. Basically you’ll be buying a Toyota Corolla or Honda Civic for 1 Crore. Even if we assume that the 80’s were relatively turbulent times and that inflation would decrease now and in the future (which is such a laugh considering the current situation)…even taking an inflation rate of 5% is pretty bad. Would you deduct the risk-free rate from the inflation rate to get the real rate of money devaluation? Also, do you have an idea on what the average risk-free rate for India is? You should take it so negative , rising price and earnings are totally fine , If prices will rise, so will your income , thats the rule . So whats the main worry ? 1)Do you think that Indian Govt posts correct rates of inflation. Does it not compromise/reduce the rates for political reasons? 2)According to me there are two reasons for inflation. (a) One is due to local market(like food,vegetables,sugar,etc). India’s population is growing at high rate. But production of basic necessities is still low. Everyone needs vegetables,sugar,rice,dal. They cannot compromise in that. So due to this local market imbalance, these rates will always grow. This will not be impacted due to recession or slow down. (b) Second is due to the general market(like real estate,shopping,education). This is when the overall market grows(Sensex growing high), people get good jobs/hikes due to good job market etc. This is the cause for high increase in real estate, education costs, Shopping etc. This will be low during recession times. However the impact on (a) will also be on (b) but the impact is minimal. So when you say that the inflation will be 5%-6% going forward, does that mean that the sensex will not grow much higher in India? Also does it mean that the job market will not be so good, real estate prices will not be like the way it was in past 7-8 years? Pls. clarify. 3)Why do Banks change the intrest rates? Is it according to inflation levels? Can there be a situation where the bank interests will fall down to 2% or 2.5% while the inflation is still 8% or 10%. Why am asking this is, in countries like USA, the bank intrests on fixed deposits will be only 1% or 0.85%? Can this also happen in India? 4)The dollar vs rupee was 39 in 2007. That time Indian economy was good. But now its 46. So, rupee is losing is value. It might so happen that the inflation goes high 10-12% in India for next 8 years. Real estate going even more high, people getting more hikes. But the dollar vs rupee becoming 60. It means that rupee is losing value. People say India is developing country. But I see that though the Indian market came out of recession quickly, the dollar rate is high. This only means that rupee has lot its value. I don’t think it means the Indian economy is recovering. Is that correct? What is the use of sensex reaching 30,000 points when dollar rate is 60-65? Will the rate of bank interests be always less than the rate of inflation? Will it be the case that the real returns will be always in negative if we invest in Fixed Deposits in Banks? 3. Sensex relation with forex is tough thing to predict , so i cant take a call on that . The author has been quoting thrughout the website in various article that historically investing in equities has given 15% returns. The author has not backed this by any data. If one looks at the DowJones, NASDAQ, BSE Index and track them from 1950s, 1980s, etc….their returns are certainly not 15%, plus one deducts the transaction cost involved, it comes still down. While this is a guest article , still i would like to comment on that . Also , we are assuming that portfolio rebalancing and atleast a yearly review is being done by investor . On inflation front one point pops up in my mind every time. when ever we make any investments on which gains are taxed for eg: Fixed deposits,short terms gains Etc,we pay taxes on the gain made,but the real case should be that we should be allowed to pay taxes on net gain only that is Return Rate – Inflation Rate,Inflation should be calculated before paying taxes,because higher inflation, the government is also responsible,in this way the government will also be answerable to the common man. Agreed, but this will never happen. If you look at the history of taxation you will find that it is started as taking money from the rich to serve the poor. But the rich knows the game and they never pay taxes. Ultimately tax is paid by the middle class. You can see so many rich Business men in India who pay no tax but they lead such a lavish lifestyle. 30k per month now means 5.24Lacs per month after 30 yrs at 10% inflation and u need approx 6.3Cr to meet yr requirement and not 17Cr. Sorry I did not explain my logic correctly. I have a formula for retirement planning. If we consider the after tax return at 8% then we can spend only 4% of opening balance in that year. This means we will reinvest remaining 4% into the savings so that we can spned more money next year to take care of the inflation. I cannot attach a table in the reply. Put the below numbers in MS excel. B2 = 1 Crore, C2 = 0.08XB2. D2 = 0.04XB2. E2 = B2+C2-D2. B3=E2. C3=0.08XB3. D3=D3*1.08 and E3= B3+C3-D3. Now just copy this for 30 years. You can see that I’ll need about 1 Crore to spend about Rs 30K per month to start with. If you are convinced about 1 Crore requirements for a person who is retiring today then you can calculate what you will need when you will retire. Mind you with 30K your retirement will be just a very ordinary one. No Golf club membership or foreign trip or regular restaurant trips which I believe will be common place for most of you who are around 30 today. Manish’s calculator says @ 35,000 per month increased at 10% per year with a return of 10% for 17 years gives a corpus of 3.28 crores. Can you please explain how you got 17 crores? 1 crore @ 10 % inflation after 30 years gives 17.44 crores. Also it should be D3=D2*1.08 in your excel calculations. If I use your formula: 1 crore will last only 26.5 years and not 30 years. Use Manish’s retirement calculator to check. Thanks for pointing out the error in D3=D2*1.08 . You are right. I got 17 Crore by using Manish’s calculator to get the future value of 1 Crore at 10% inflation. Also, you are right if we start with 1 Crore and get 8% return and consume 4% of it we will run out of money in 26 years. That is the point. That because of inflation, your expenses increases and once you touch the principal it is very fast race to the finish. But I think 26 years is OK for retirement planning if you are retiring at 60 it will see you till the age of 86 which I guess is probably enough for most. The scary part is what you have rightly mentioned , if the interest rate falls then the return is further reduced and then you cannot manage with the income which means we will need even more money to start with. else, we will have to work longer, if not in permanent job then seek part time work. This is already happening in the west, where even 65 years old are being forced to take up part time work just to make ends. Also, as you said, you cannot save entirely in debt after retirement. But that is a whole new area. I do not think this site has too many readers who are nearing retirement. Most of us are in the accumulation phase and thus we should start with a number and then review every 2-3 years and set new goals. I can tell you I have revised my retirement corpus upwardly many times in the last 10 years since I started the process. In 2000 I quit my secured job in one of the Big Manufacturing companies to start life in IT. I was not sure if I’ll survive here thus I thought I need about 50 Lacs. I started investing with that target in mind. In time I reached that target but I realized I need much more than 50L. This was due t two reasons , inflation and my upward mobility. While I was Ok to have a vacation within India back in 2000 , I now want to travel around the world. I want bigger house and a better lifestyle. thus I am still in the accumulation phase. But I want to share one message to all of you , it is possible to accumulate Crores in a growing economy like India. You need patience and discipline and you need to start early. Thanks Gopal and Manish. Very well written article. This is the first time i read about this formula. very helpful. Samething happend to Argentine Dollars. A very good series came on TV called The Ascent of Money. Very informative. Great Article, Nice Job, Gopal and Manish…. Excellent. It cleared many of my doubts. Great to hear that , can you share what your doubts were ? very good post gopal and manish….such articles always help us to re-visit our investments objectives and measure them accordingly. compounding effect in the long term sounds very scary, if you compound education, marriage & other expenses for 25 years, it runs into crores. Similarly, an MBA who earns 10lacs today will also earn 1cr after 25 years (@10%), sounds reasonable??? In 1983 I joined Engineering college and our mess bill ( for lunch and dinner only) was 170 rupees per month. By the time I graduated in 1987 it became Rs 300 per month. I paid tuition fee of about 500 Rs per year. Now my college charges 25000 per year. I joined NTPC in 1987 and my salary was 2000 per month ( net) . I spent about 800 per month. Today, I guess both income and expenses have grown by tenfold. Also, remember the inflation of different things are very different. For example many manufactured items like electronics and automobile actually do not increase that much and thus brings down the overall inflation number. Thus I’ll say we should take 2 % margin when planning for an expense which is 15 years away. If you are 30 and you think your expense at the time of retirement will be 30000 per month ( at today’s price) you will need at least 17 Crore as retirement corpus( with 10% inflation). Looks a very high figure and most of you may think I cannot reach this. But you can. Let me show how. If you save 35000 today including the PF( your + company contribution) and you increase this at 10% per year then you will reach 17 crore in 30 years at an average return of 10%( considering PF gives only 8% return I have used 10%). Wow.. this post is very interesting as well as a useful tools for personal financial planning. I will read it again and again. Very nicely written article in a very simple style so that every person can understand the meaning and effect of inflation. Great to hear that you liked it , How is your personal finance learning going on , Make sure you ask questions more and more . i) in the long run rupee should appreciate against dollar(vis-a-vis euro, pound) and technically this should deflate the rupee. ii) A high inflation should counter for increase in repo and reverse-repo rates.This would slow down the economy. iii) Developed countires have a inflation of only 2-2.5% YoY.India is like a backoffice for the world because of its cost-effectiveness. If inflation in India is 8%, then every year rupee would be inflating by 5.5-6% more than the developed counterparts.Over long run this can mean that the developed countries would probably not find any more cost-effectiveness outsourcing to India. Nevertheless, a bad monsoon, increase diesel prices or unstable government could still easily cause high spikes in inflation figures. Thanks for posting the article. Its nice to see that people liked the article and it feels nice to read their interesting comments on the articles. Thanks to all the readers for their comments. How about some one who invested in housing loan for a tenure of 20 years. Does a 10% inflation over a continours 20 years of period mean that he is profitable in his repayment? No , One has to look at real returns at the end , if real return is more than 3-4% then it would make sense . Excellent post with very good examples. Thanks , do you think inflation for next 10-20 yr will stand at 6-7% ? I don’t think inflation we be at 6-7%, it will be over 10%. I dont think so , I should be below 10% , may be in 7-8% range . When it comes to Child Education, Parents should find the cost of several degrees when they start investing and update this data every year. Only then they will know if their investments are on track or not. Taking some average inflation (8% or 10%) is good for a start but real trends are needed for monitoring. I don’t think a CFP can help in this regard. The same holds for retirement also. Monthly expenses have to tracked over years to ensure the nest egg is growing the right amount. I agree , for the start a general number is good , but then tracking is very important , else things can badly go wrong . Very good article. Well explained in layman’s terms. Just wanted to add that the inflation of some things are actually much higher than the average inflation. For example the cost of higher education and health care is increasing at a much higher rate. Also, we should remember the life style increase that is happening in India. All of us are slowly become richer and thus the expenses are becoming higher. For example 12 years back I did not have a even a land phone in our phone forget about mobile or internet. But today we have all three expenses. Similarly the AC has become a must in the bedroom. 10 years back we used to have Maruti 800 as our first car. Today you have to have at least a Santro. All these are constantly pushing up the cost of living. With no social security or pension for most of us we need to take Financial Planning much more seriously. Cant deny the importance of starting early, however it will be interesting to see if cost of study will go that much higher or it will stabilise at certain point in future. Cost of study will go higher definately , The trend till now has been up and like all the other commodities , its price should also go up . Do you have any reason why cost should stabalise ? When I enrolled for Eng(2004) . My annual tution fees was 46K (add 2000 per semester Examination Fees which makes Cost to 50K). Now annual tution fees for Engg is around 75K. So just imagine What will be Cost of education after 15-20 Years. Manish its realy nice article. what is inflation? how to callacute? I hope you are clear about “inflation” . Its the rise in prices in general per year . Its the data released by Govt .for info on how exactly its calculated , I am not the best source , read on net .